I decided to get a head start on this technology and have gone through the process to produce a PWA for digitalmediaphile.com which runs on WordPress. It took some “fiddling” so I am sharing the process here. When you follow the instructions in this article all the way to the end, your Progressive Web App for Windows 10 will be ready to submit to the Windows Store. 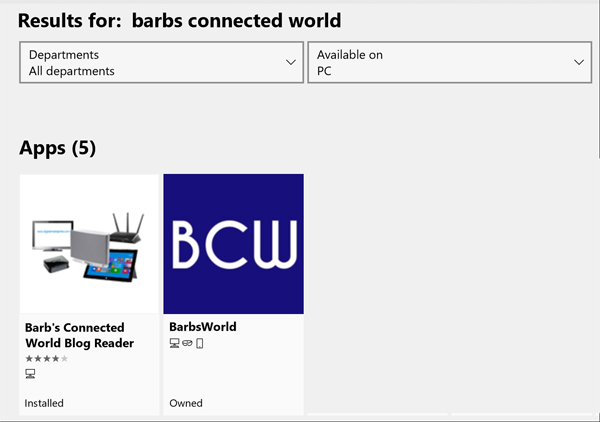 I’ve turned this blog into a PWA, and if you search the Windows Store for barbs connnected word, you’ll find both my old Windows 8.1 app and my new Windows 10 PWA. FTP or Remote Desktop access to the blog server to upload files. A child theme (you will need to edit header.php and you don’t want to do this on the main theme – using a child theme preserves your customizations if the theme is updated. 2. On your original main theme, create a backup of header.php either using copy and paste or ftp or RDP. 5. Use FTP or RDP to copy and save a copy of the png’s referenced above to your local computer and then delete these png’s from the server. 7. Go to https://www.pwabuilder.com/ and scroll to the bottom of the page and select the PWA Image Generator and upload the 1024.png and generate and download the image package. Give this a few minutes to complete as images are being generated and then downloaded. 9. Extract the zip file to your local computer and then upload the AppImages folder to the root of your site so that all the folders and content are on the remote site. 10. Test the child theme you created in the first step and then activate it. 12. Save the file and test your site again. 13. Here comes one of the fun parts. pwabuilder.com has some bugs and can’t properly generate a manifest.json file. You can use this sample which is for a “standalone” app. Makes changes to name, start URL, description. note that the icon values are taken from icons.json, but the path is edited and /AppImages/ is pre-pended to each entry from icons.json. Save the file as manifest.json and upload to the root of your site. Test your site again. 15. Upload the edited header.php to the child theme directory and test again. Next, we will be creating Service Workers for both non Windows platforms and Windows 10. We’ll tackle the non Windows platforms first. 4. I used the second option, Offline copy of pages (you will see the code change in the right hand frame). 5. You can copy that code to a text editor for reference. 7. Select Download and wait while the package builds and download it and save it. It will show the shortname.zip. 8. Copy the following code into the header.php of your child theme, right below the meta name=”viewport”… entry. Upload the edited file and test your site. 9. From the extracted files, navigate to the ServiceWorker1 folder and upload both .js files to the root of your site. Test your site again, of course. To test your PWA enabled site for non-Windows platforms, open your site in Google Chrome and navigate to More Tools, Developer Tools and then perform an Audit. For purposes of testing your PWA, deselect everything except Progressive Web App (or you can run all the tests). Lighthouse will run on the site. If issues are found, there should be information to help you address them. Now we are ready to build a PWA for Windows 10. The pwabuilder.com site has the framework for build an appx to submit to the Store, but it is not fully functional. The appx generated contains generic store icons, etc. that you will need to be replace so that your app identity and images are consistent. While you can rename the appx suffix to zip and them look inside folders and even extract and replace pngs, etc., if you just re-zip, it will no longer be a valid appx file. You will need the Advanced Installer program as I mentioned at the beginning of this article. 1. You’ll need a dev center account if you don’t already have one. Go to https://developer.microsoft.com/en-us/dashboard/windows/overview and create a new App. Be sure to use the exact names you created in manifest.json for the app name and short name. You’ll need to go to App Management, Manage app names to add the short name. 2. Go to the App management, App identity tab. Stay on this page while you open a new browser window at pwabuilder.com and enter your URL again. Immediately go to Next step. Again, change the service worker function to Offline copy of pages. Go to Next Step. 3. On the Windows side of the page, select download and save the zipfile. 4. Extract the zipfile. 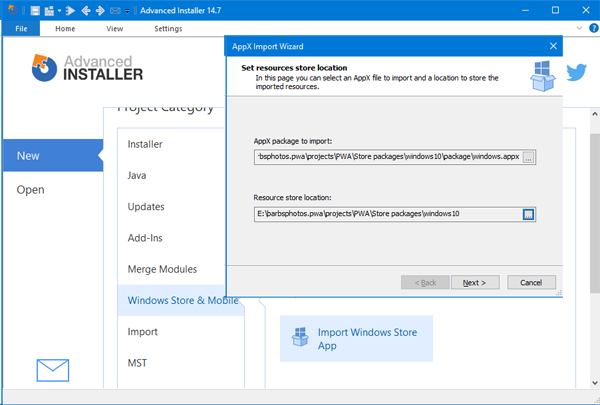 Navigate to projects\PWA\Store packages\windows10 and right click test_install.ps1 (your computer needs to be configured for developer mode) and then “run with powershell”. Select Yes if prompted. The app will install. 5. You will find the app on your Start menu. Note the generic PWA icon. We will replace this in a later step. You can now take screen shots for the Windows Store. You can uninstall the app after you grab screen shots for the Store. 6. Next, generate the APPX file on the pwabuilder.com site (if you closed the site, be sure to change the setting for the service worker as in #2 above). Enter the information from https://developer.microsoft.com/en-us/dashboard/apps/xxxxxxxxxxxx/identity where the x’s are your apps’ designation and specify a version number. You need to use a version number ending in 0, so 1.0.0.0 or 1.1.0.0, etc. will work. Select Submit and download the app package. The Submit spinner keeps spinning (this is a bug) so you can ignore and close the page. Save the file that downloads. 7. Extract the yourappname.zip file. Be sure you know where the windows10 app image folder is from the beginning of this article in step 8 as you will need some of these images to replace the generic images. 8. 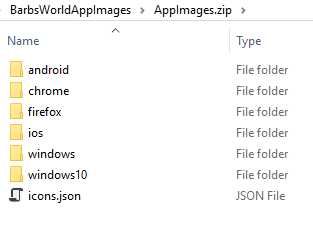 In the extracted zip file hierarchy, navigate to \projects\PWA\Store packages\windows10\package and find the windows.appx file. 11. Still within Advanced Installer, navigate to Package Definition/Files and Folders and then to the images folder. Right click each of these three files and select properties. Select … and Source Path and again navigate to the folder above. 14. In Advanced Installer, select the Home button, then Build. Then select Build in the dropdown. 15. A file will be creates with appname.appx. Copy this to windows.appx. This copy named windows.appx has all the correct images and information and can be submitted to the Store. Finish your submission to the store, drag the windows.appx to the packages section and cross your fingers!